"Apple pie baked with a cinnamon crust." 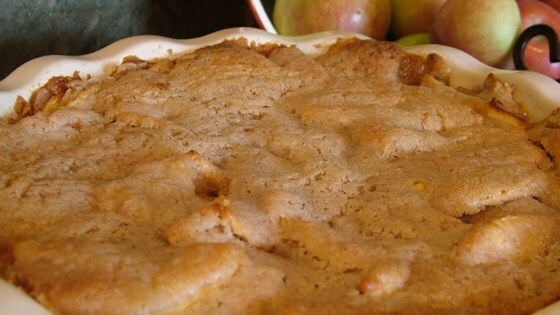 Toss apples with 1 tablespoon of sugar, and pour them into a pie plate. Thoroughly mix together 1 cup of sugar with the flour, cinnamon, butter, and egg. Spread this evenly over the top of the pie. Bake in preheated oven until the apples have cooked and the topping is golden brown, about 40 to 45 minutes. It tastes better when cold. It must be refrigerated because of the egg though so be careful. Wasn't as good as my apple crumble so I don't think I'll make it again. I have to agree with Justa' Mom. It was good but needs more flavor. I am going to make again but will try some adjustments. VERY EASY... and absolutely, hands down, the very best apple pie I've ever tasted. Bravo. 5 stars.